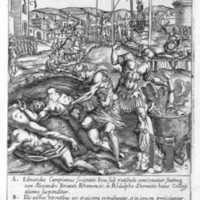 This image depicts the infamous Tyburn Tree, location of mass executions in the Tudor age. Convicted criminals could be hung from any of the three sides of the triangular structure, allowing multiple hangings simultaneously. 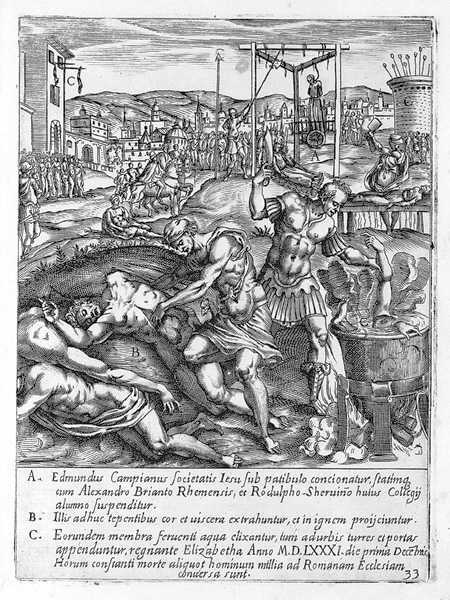 Engraving by Giovanni Cavallieri after Niccolò Circignani from Ecclesiae Anglicanae Trophaea (Rome 1584), “The Martyrdom of Edmund Campion, Alexander Briant and Ralph Sherwin (with Tyburn Tree in the background, 1584),” Medieval London, accessed April 22, 2019, http://medievallondon.ace.fordham.edu/items/show/165.